It was a foggy start on the coast this morning. With a cool NE breeze as well, it didn’t feel like a day for spring migrants, but we had a half-day out booked. I was asked whether it might be possible to see Wrynecks at this time of year and, knowing that there had been one on Blakeney Point for the last couple of days, I thought it might be worth a try. As we arrived at the beach car park, you could barely even see the sea, but we decided to have a go anyway. And we were glad that we did. 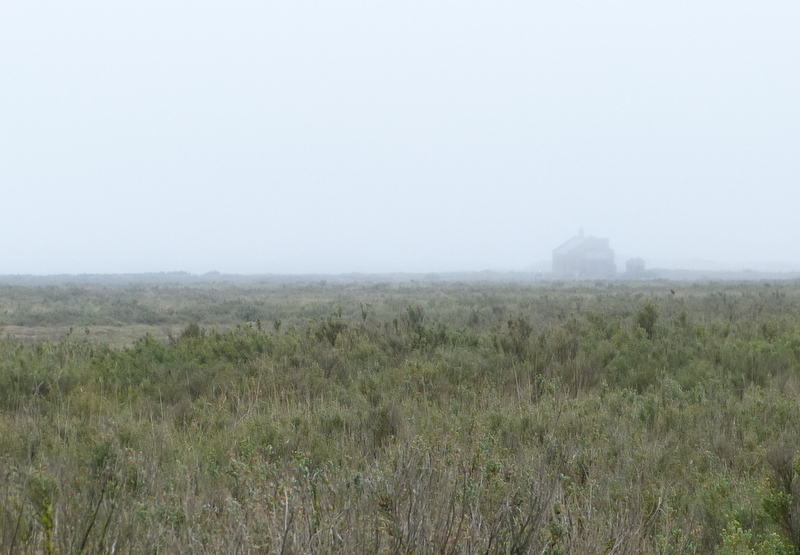 As we walked out along the shingle the mist started to lift a little and slowly the birds started to appear. 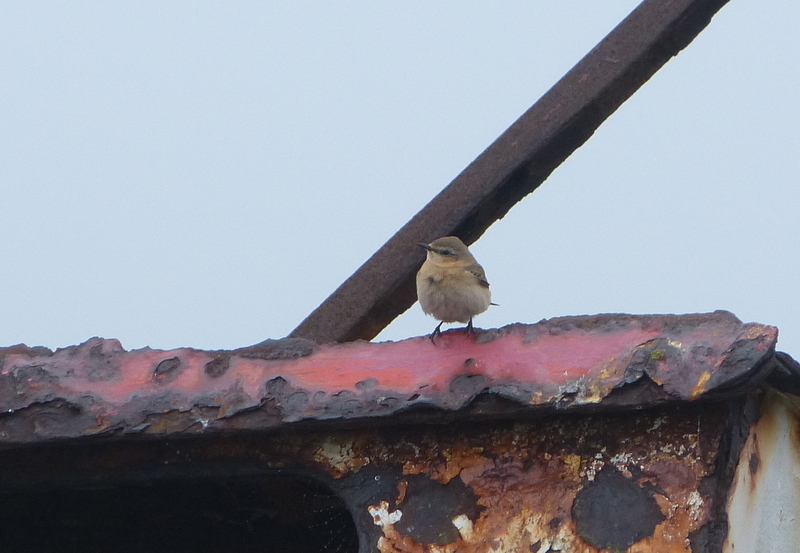 At first, we came across a few Wheatears. Then a late Fieldfare flew up in front of us. A Willow Warbler and a couple of Chiffchaffs flitted about in the bushes and a Tree Pipit flew over calling. Suddenly three large white shapes appeared out of the mist in front of us – Spoonbills – flying off west over the harbour. Best of all, a loud ‘tchacking’ behind us revealed a female Ring Ouzel. Arriving at Halfway House, we had no trouble relocating the Wryneck, though it was a little flighty. By now, the visibility had improved and we could see out across the harbour. A couple of Little Terns were sitting out on the mud, two Common Terns were feeding over one of the channels, and a good selection of the usual waders was on view. Feeling thoroughly satisfied, we decided to head back. There seemed to be even more Wheatears now, but just to round the morning off nicely a female Redstart flicked up in front of us. Quite a morning’s haul, given the conditions we set out in. Migration has been on and off the last few days. April 12th was a really good morning to be on the coast, lots of birds were moving. Several Yellow Wagtails and Tree Pipits flew over, and good numbers of Meadow Pipits and Linnets. Hirundines were also passing through, with a fair count of Swallows. Since then, things have mostly ground to a halt. The wind has been cold, off the North Sea, and very few birds have been actively moving. At least today the wind had swung round to the south-east. Still not great to see migration in action – the birds seem to prefer a headwind, which means we really need a westerly – but migrants seem to be getting through again. 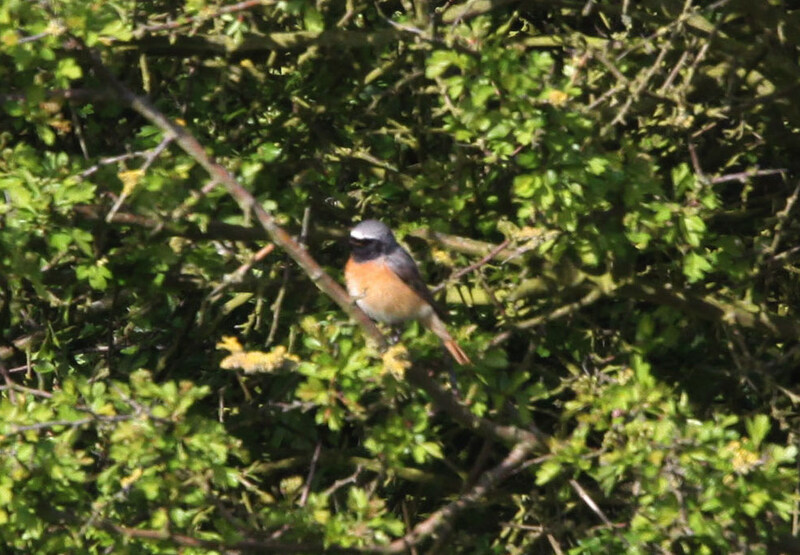 A morning spent exploring the coast produced the highlight of a splendid male Common Redstart, working its way along the hedges in the sunshine. Generally more common in autumn, it is always a particular joy to see one in spring. A Sedge Warbler was also new in and singing away from some brambles. While the wind was still fresh, it was a great day to be out. Back to the Brecks for a tour today. The mission was to see some crossbills. In the morning, we were spoilt with lots of Common Crossbills – calling, singing, chasing about through the tops and sitting about in the deciduous trees by the folly at Lynford. One Firecrest was also still performing for the crowds there, and heard another singing. Moving on, we found some Stone Curlews showing really well, and close. One bird at first, then a second appeared, with some calling and then a bit of ‘deep bow’ display. Great to watch. Also, a lovely pair of Woodlark gave us good views. Lots of finches still, particularly at Santon Downham. Groups of Brambling everywhere in the tree tops, calling and singing, some of the males starting to look particularly good. Plenty of redpoll as well. Back to Lynford in the late afternoon, and we stumbled across the Two-barred Crossbills almost immediately. For once there was no ‘toot’ing heard, but two males and a female (all 1st winters) were sitting around in the trees round the folly so we could watch them for some time. Also a Hawfinch flew over calling, but not long enough to get everyone onto it unfortunately, and a Mealy Redpoll in the alders by the bridge to round the day off. Mission accomplished! 9th April 2014 – Taking Over – Beginner’s Luck? So it’s official, I’m taking over from Stuart. I have a lot to live up to! I hope it should be a fairly seamless handover, and it will certainly be ‘business as usual’ in the coming months. I popped down to the Brecks briefly today, just to catch up on what was what. I have been visiting all the same sites myself for years, and have a very good grasp of where to find things, but it feels different when it is business rather than pleasure. What a morning! Within 2 hours, I had seen Two-barred Crossbill and lots of Common Crossbill, Lesser Spotted Woodpecker, Goshawk, 2 Hawfinch, Stone Curlew, Woodlark and a very showy Firecrest! Was it beginner’s luck? I like to think it was the benefit of years of practice! Either way, long may it continue.